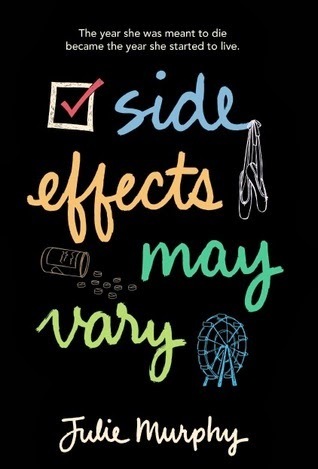 Side Effects May Vary is a good read, plain and simple. The two main characters – Alice and Harvey –worm their way into your consciousness. The story is fairly simple, yet still compelling – a girl who has cancer does a bunch of things that she might or might not regret when she finds out that she’s in remission. The writing, with the leaps from “Then” to “Now” and shifts in which character we are following along, is effectively accomplished and flows easily. All these things make Side Effects May Vary a strong, absorbing read. Alice is not easy to like, especially since you are privy to her antics and moods. In fact, she’s decidedly unlikeable, with her rude behavior and selfish actions, and I was sorely tempted to shake her hard a few times. But if you try to understand the situation(s) she’s dealing with, it’s a little easier to understand why Alice can be so cold and vicious. She’s raw and complicated, and I just loved that she was so different from other characters I’ve read about. This same character complexity exists with Harvey, the boy who has known and loved Alice for most of his life. He was definitely easier to like, though I really wanted to shake him hard too for allowing Alice to take so much advantage of him. But Harvey is the kind of guy who is constant, and sweet, and nice. He’s the kind of boy you’d want to fall in love with because he will love you steadily, without question. Their relationship is definitely central to Side Effects May Vary, the sun around which everything else appears to orbit. Other concerns – family, friends, enemies – certainly become a part of their paths. But the novel focuses on their friendship, and how Alice’s leukemia winds up changing everything about it. It’s an interesting take on the “teen with cancer” story, which is really what I loved about it. The novel spotlights the highs and the lows of Alice and Harvey’s story so well, that I felt like I really knew them both by the time it had ended – good and bad things, struggles and secrets and hopes and fears. Julie Murphy masterfully tells the tale, using the jarring changes in time period and character perspective to enhance the reading experience. After taking a little time to consider it, I can say that I quite liked Side Effects May Vary. Did it completely blow me away? Not necessarily. But it certainly made me feel, and also think, and that’s enough for it to have left a good impression. There can certainly be no doubt that Side Effects May Vary is the kind of story that leaves its mark. It was the same for me, I appreciate this book for what it is, but I wasn't blown away by it and I felt that the story had the potential to be mindblowing, so that was slightly disappointing. I'm with you on the shaking Harvey part ;) Hes such a sweet guy who deserved to have a girl love him as much as he loved her. I really liked how Julie Murphy didn't sugarcoat the leukemia and the treatment, it felt real. I haven't read this one yet, but I've heard a lot of reviews stating that Alice wasn't the most likeable character; but it's always good to see another perspective. I like how you stated that while she's mean, there's definitely a motive behind it. Although it's a shame you didn't get that extra "umph" from this one, I'm glad that you enjoyed it overall. Definitely going to have to give it a try! :D Thanks for sharing Alexa, and, as always, brilliant review! I'm glad you enjoyed it more than I did! I really tried to give Alice some leeway and understand her situation but it was also quite difficult to when she consistently did the same things to Harvey. Harvey really deserved someone better but then again that history he shared with Alice. I am interested to see more of Murphy's writing because she showed that she has the potential to write impactful stories. Great review Alexa!